In Panel Panopticon, Nick Hanover and friends talk about the comics they’ve picked up for the week, good, bad or otherwise. This week, Dylan Tano joins in as the two discuss a couple new creator owned series and some Marvel work that is of varying quality. Whether it’s due to the success of The Hunger Games or just a general cultural shift towards these kinds of stories, lately more and more comics featuring young adults in dire straits have been popping up. Marvel had the sorely underrated Avengers Arena, Morning Glories is still going strong over at Image and now Boom has The Woods, a new original series by Big Two vet James Tynion IV that it touts as a YA comic with a Stephen King-like small town horror vibe. In its first issue, Tynion and artist Michael Dialynas thrust us directly into the hormonal chaos of Bay Point Prep, a small high school in Milwaukee filled with kids worrying about normal high school things, like college applications, love interests and mischief. Like most slasher flicks– and their highly evolved, meta successors Scream and The Faculty— The Woods counts on cliches to build up reader expectations. 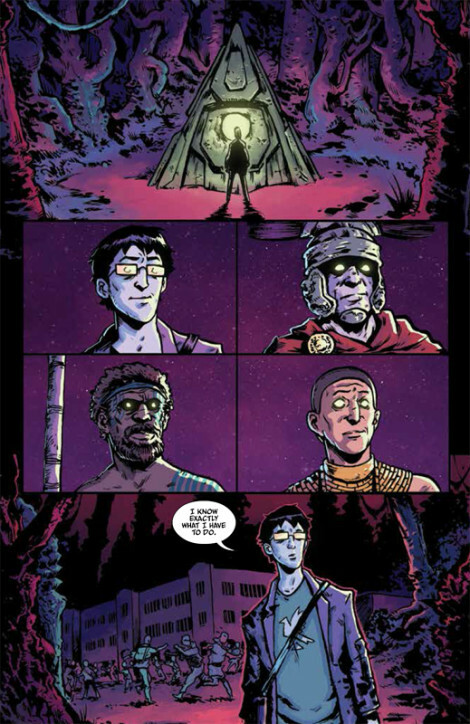 The first issue introduces a cast that rounds up the usual teen horror suspects, from the theatre geek to the nerd to the rebel and beyond but Tynion’s script begins to subvert those expectations the instant the school is inexplicably brought into an alien world. The Marvel NOW! Initiative has yielded a lot of fantastic work from the publisher, but one of the best things to come out of the line is the increased number of all-ages comics, from Nova on down to Ms. Marvel. 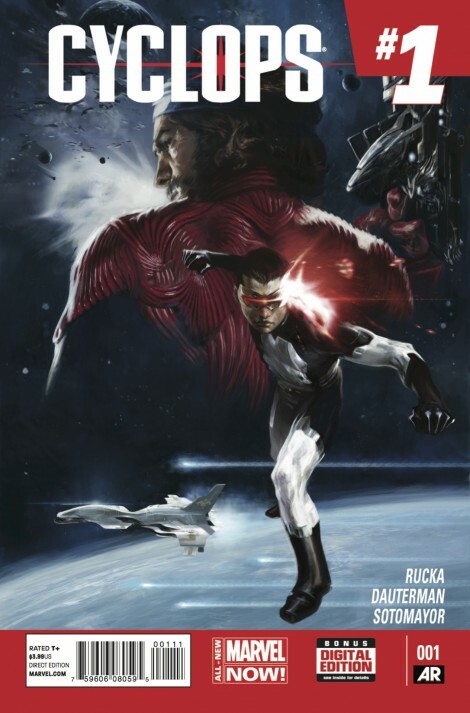 Though he might seem like an odd choice to helm an all-ages series, with Cyclops #1, Greg Rucka proves to be surprisingly well-suited to all-ages work. Given that Moon Knight #3 is set in New York City and involves ghosts you might initially mistake it for a Ghostbusters comic. 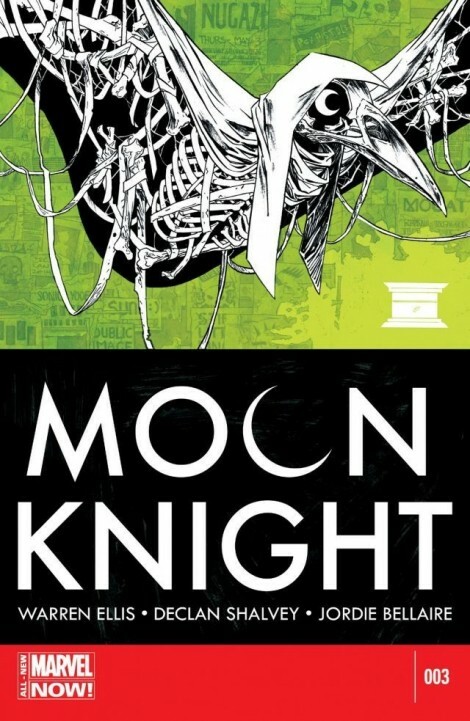 Warren Ellis weaves a quick and enjoyable tale to incorporate some of Moon Knight’s more paranormal Egyptian mythos. It’s a clever way to introduce new readers to that side of the character, especially since it has only really been teased in the first two issues. It’s hard to think the little Ghostbuster parallels are an accident, after all this year is the 30th anniversary of that franchise. 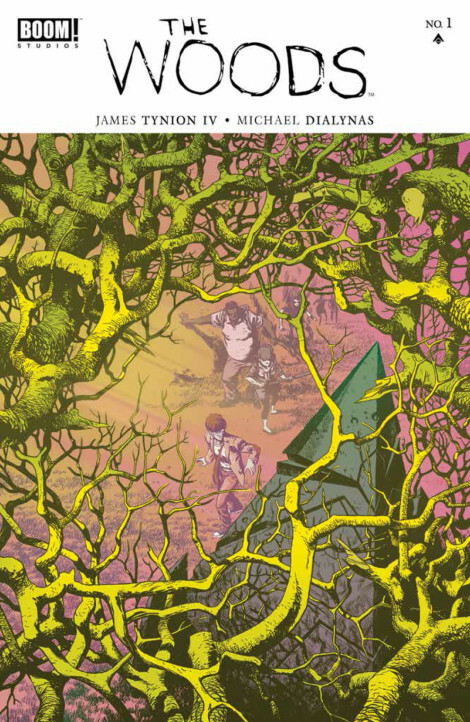 Shalvey and Bellaire continue to impress with this series. The variety and flair of everything on the page flows amazingly well together. The skyline casts an eerie feel. 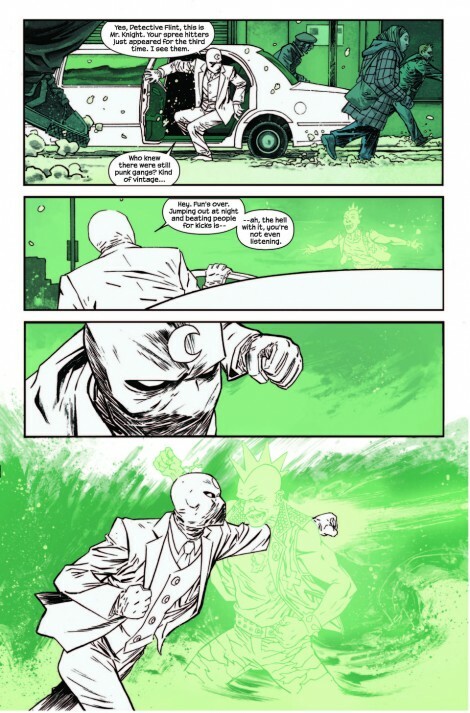 The color (and lack of color) continues to be some of the best work on a Big Two comic. We get to see a bit more of Shalvey’s Egyptian stylings and they are suitably creepy. Spektor walking down a set of stairs with a giant bird’s skull on is particularly weird. The drawback to publishing your new comic at a company that has in many ways revived the genre you’re working within is that it leaves you with some mammoth expectations to overcome. 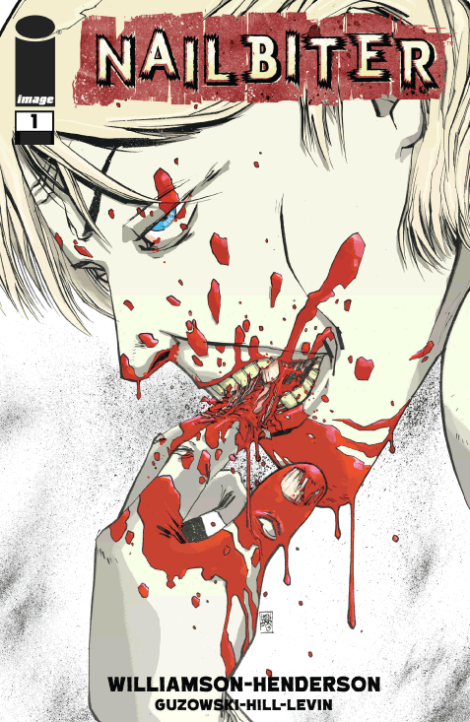 Image may be the perfect publisher for a creator owned horror work like Joshua Williamson and Mike Henderson’s Nailbiter, but the series’ first issue fails to surpass expectations and rise to the level of debuts from similar series like Green Wake, Fell or even the more recent Bedlam. Structured as a serial killer epic stuffed full of flashbacks and info cards, Nailbiter’s first big mistake is its reverence for the serial killer horror subgenre itself. The world of Nailbiter is one in which Buckaroo, a small town in Oregon, is responsible for the origins of 16 of the world’s worst murderers, all with their own quirky gimmicks, from the “Book Burner” who gets vengeance on illiteracy by burning down places full of books and people to the titular Nailbiter, who hunts people with the bad habit of chewing their nails. A few years after the Nailbiter has been caught, Agent Finch is called out to Buckaroo by the arresting officer, Carroll, who claims to have unlocked the secret of Buckaroo. Of course, by the time Finch arrives on the scene, Carroll is missing. Williamson’s script lacks any subtlety or nuance, to the point where after Finch is introduced just as he’s about to kill himself, his first human interaction in Buckaroo is with a young woman suggesting he not chew his nails in Buckaroo because, well, you know. 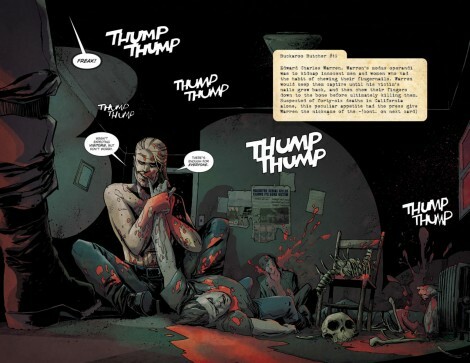 Henderson’s art is serviceable, but even it just suggests better works, featuring as it does a mixture of Rob Guillory’s rubbery Chew style with the abstraction of Ben Templesmith. Henderson’s character designs are also unfortunately uninspired, with the Nailbiter himself bearing more than a passing resemblance to, and sharing an oral fixation with, American Vampire’s Skinner Sweet, while the Book Burner sports an inexplicable burlap sap mask that recalls everything from Nolan’s take on The Scarecrow to Nightmare Before Christmas’ Oogie Boogie Man. Published by Marvel Comics, Inc. 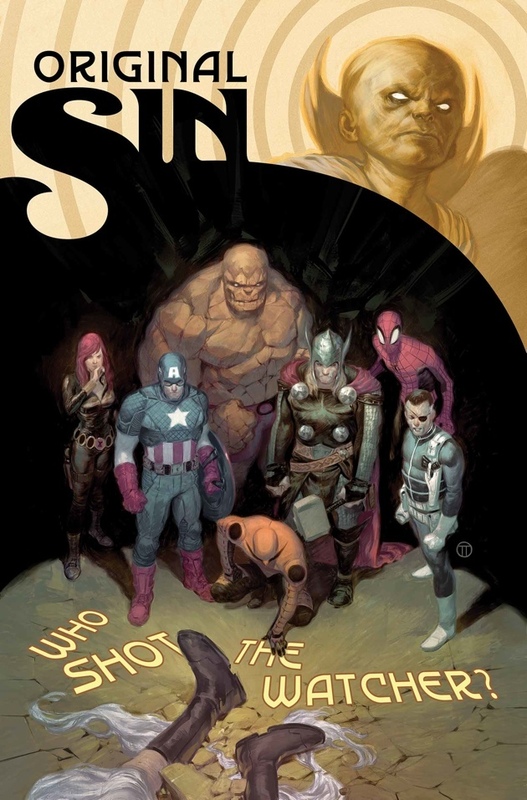 Original Sin is the latest event from Marvel designed to take money from our pockets by inundating us with tie-ins. Even though Jason Aaron has been doing a very good job as of late with all of his projects, any event style comic leaves me with some trepidation going in. They just haven’t been very good lately no matter who is doing them. So the premise of the series has been floating around the internet for a while, “Who Shot the Watcher” is scrolled beautifully across the cover. Mike Deodato handles the art while Frank Martin colors bring it to life. I didn’t have a lot of expectations going in and while the first issue didn’t thrill me, it was better than expected. 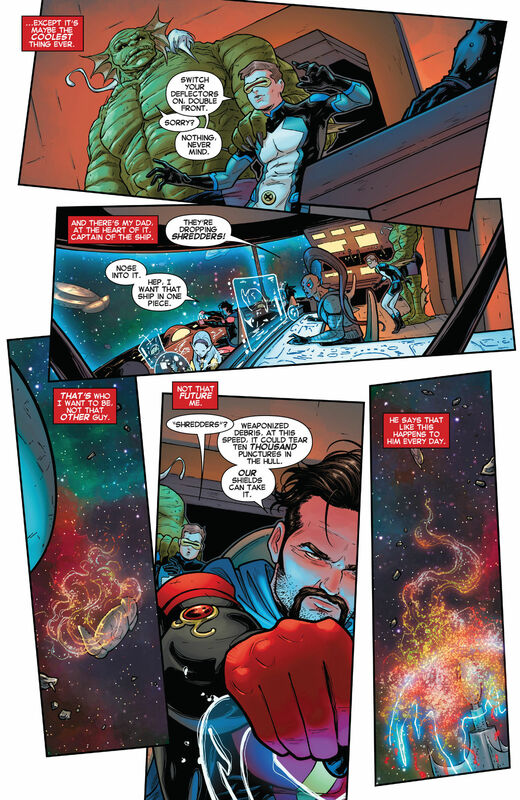 Jason Aaron spends most of the issue setting motive and bringing the players into the fold. The pairings so far are interesting, at least the ones we know about. Dr. 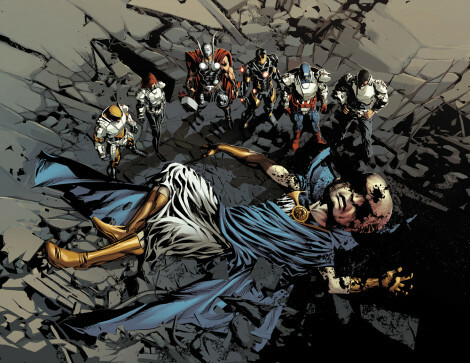 Strange and the Punisher, Emma Frost and Scott Lang, and the Black Panther all make up Fury’s team whose purpose it is to solve who shot the watcher. Dr. Strange and the Punisher in particular make up a very “odd couple” team. The first issue played like a heist film in the way they set up the motive and the way the teams were assembled. That breaks away as ultimately this is going to be a “who dunnit and why.” This seems fairly grounded in scope– at least in relation to, say, Infinity or Age of Ultron– and because of that I am a little excited to see where it goes. 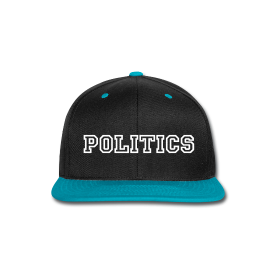 One thing that continues to irk me is the “Tie-In” method. This could and should be nothing more than an eight part event series that doesn’t need to spread out into other comics unnecessarily. Judging by all the “Original Sins” previews, it just looks like a bunch of retcons are coming, which I can’t say I’m excited about. Deodato’s art is detailed and darkly colored by Frank Martin. They pair well together and the art is one thing in the comic that I have no issue with. The moments with The Thing and Spider-Man stand out. They were particularly well done. Deodato and Martin have a good understanding of the rocky Thing and how to shape him.